Extracurricular Activities : Dance and Music. Sports. One team won the first prize in 2002 in a dance competition on District-level. The Omkarananda Kunja Shishu Niketan, Duadhar, is perched on a quiet and peaceful hill slope, with a spectacular view over the valley below, vast terrace fields and a beautiful mountain range. This School has a very conducive environment for studying as it is in a very quiet area. It is a Junior High School, providing education from Nursery to Classes VIII. The nearest temple is Kunja��puri Temple which is 5 km away. It has special celebrations for Navaratri every year. Beside the formal curriculum, the children play Kho-Kho and Kabaddi for sports. 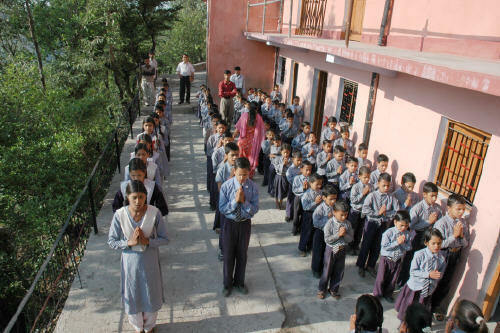 The School also teaches Garhwali, Raja��sthani and Hindi songs and dances. The School Team often participates in competition with other schools on District-level.